Pin it! 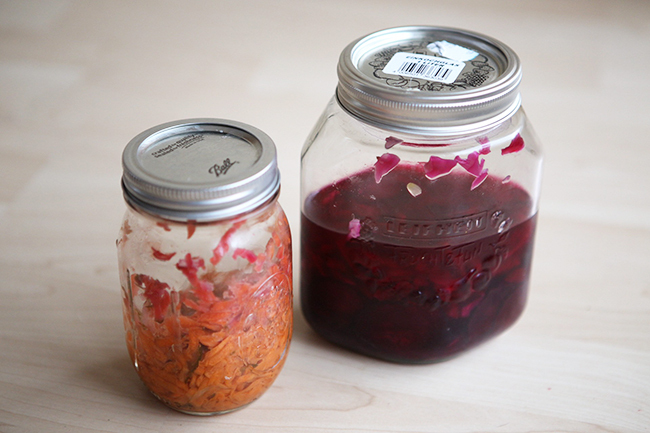 How to make your own fermented veggies. Fermented foods are a huge part of the GAPS diet, which I am doing to heal my gut after long term antibiotic use for Lyme disease, so I was excited when my husband suggested we try making some. Fermented veggies are loaded with probiotics, and also contain digestive enzymes, which is why they're such an important part of the GAPS diet. They're easy to make, too - the most difficult part is waiting for them to ferment! In one mason jar, put the carrots and cucumber, water and salt. Make sure the veggies are submerged in the water. Add more water/salt if necessary. Put a cabbage leaf on top of the veggies to keep them under the water line and close the jar. In another mason jar, put the red cabbage, water and salt. Make sure the cabbage is submerged in the water. Add more water/salt if necessary. Put a cabbage leaf on top to keep the cabbage under the water line and close the jar. Put the jars on the counter, and once a day unscrew the lid to release the gas that will build up. Let them sit for 7-14 days. The fermentation process stops when you put them in the fridge.